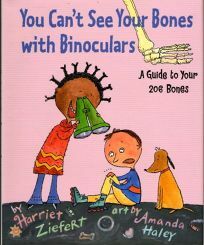 You Can't See Your Bones with Binoculars: A Guide to Your 206 Bones by Harriet Ziefert, illus. by Amanda Haley, done in the style of their earlier books (You Can't Taste a Pickle with Your Ear and You Can't Buy a Dinosaur with a Dime), uses humor to deliver information about how the skeletal system works. Ziefert writes, ""It is hard to feel your thigh bone, or femur, because it's covered by big muscles, which you need for walking, jumping, and running away from alligators!""